We start up again on April 24, 1993 at 11:59 am when the wedding guests are realizing that the groom is missing. We have a brief look at Dr. Han in 2013 pacing the floor in his office and then taking his turn at being bug-eyed as he is hit with new-timeline memories at 12:00. Suddenly he is standing outside the church with his family. He has to ask his wife if it is Sun-woo's wedding. She thinks he is being silly because, of course. We revisit 2013 with Min-young at the mortuary watching everything disappear in smoke. Then she realizes she is in a bridal gown with a bouquet of slightly wilted alstroemeria. Her mother and Boston lawyer stepfather, Joo Sung-hoon, are greeting the guests. Mom looks completely happy this time around and Step-dad looks like a nice guy (he gives Min-young a thumbs up) so why didn't we regret losing him before? Now we return to 2013 Dr. Choi with the disappearing golf club and aides. He finds himself a little the worse for wear in a small crowded medical supply shop, with his hair standing straight up, wearing a plaid shirt and sweater instead of a suit. He remembers Sun-woo saying he would take away twenty years of glory. He does a pretty good godzilla imitation kicking his new delivery van. Jump to 1993 to see what happened to Jung-woo. He comes out the church door, turns around to see Shi-ah, and walks away in the rain. And... he is standing in his white coat holding a syringe in a small clinic. There are signs in Korean, Chinese, and English; one reads: International Medical Mission. [11:00] He flashes back through a lifetime of memories to that same day in 1993. He had found his younger brother, injured, at a hospital, with Reporter Oh, and offered to tell them everything. Poor 1993 Yoo-jin is having it rough being jilted at the altar. She cries and says he's done it to her before and she can't stand it. She is going to go away. Luckily she already has a passport and airline tickets for America. Reporter Oh tells the whole story on air about the accidental death, Choi threatening Jung-woo, getting a gang member to help him, and bribing two police officers to cover it up. Sitting in the back of a cop car, Choi complains bitterly to Evil Minion that he wanted the witness dealt with, not a high school student; and Minion allows as how he was told to kill the kid. When the police take hyung to visit Mom she is outside on the patio. Sun-woo watches through the window and refuses to talk to him. During court procedings Choi tries browbeating hyung again, but he isn't afraid anymore. Hyung is awarded the ownership of the hospital and sentenced to three years; Choi gets four and a half. Sometime later Sun-woo calms down and goes to see hyung in jail to show him his college acceptance. He muses, “He told me I would understand later,” and when hyung questions who, he says, “It's a secret.” Standing in his mission clinic reviewing his memories, adult Jung-woo realizes what that meant, and smiles. [19:15] He asks another doctor what time it is in Korea and is told noon. That's when the wedding is, and he goes out to call his brother. He must be several time-zones away if it is hard to keep track of Korean time. An ecstatic Dr. Han comes into the back room where our bride Min-young is waiting. He assures her that this is real and Sun-woo has changed things back. She looks rather blank and stunned. I thought she would look happy, but maybe she is ajusting to new memories. And we see some. It's February 2013. Sun-woo is trying to sleep in Min-young's apartment and she is pestering him to propose. What? Didn't they say they got married that time in Nepal? They didn't get married yet this time around? He smiles to himself after she leaves. Jerk. Wait a minute. Isn't this the Sun-woo we knew in Episode 1 before he got serious? He is still in bed when her mother walks in a little later and surprises him. She doesn't know who he is, and neither does the Boston lawyer stepfather who comes in with the suitcases. Ha. Sun-woo is embarassed and not so arrogant anymore. He hides in the bathroom until Min-young comes in and steamrolls him into saying they are engaged. He looks crestfallen, but seems pretty happy later with her in the wedding pictures. We see Jung-woo call from outside his clinic. There is a Chinese flag, so they must be in western China if they are several time zones away. He says he can't get ahold of Sun-woo. He calls himself Daddy and wishes her happy, and she bawls. Aww, she really loved him as a dad. He says he can hardly believe he is alive, and he is not unhappy in this life. They both obviously remember the other timeline. We see the interview with Sun-woo and Min-young's parents when they first met. Stepdad is the big teddybear and Mom is the disciplinarian. Mom figures out that Sun-woo is the brother of the Jung-woo she had known. He says, “yes, how did you know?” She tells him her name and asks if he remembers her. We see his expression change as he does. Mom asks if he remembers Shi-ah; that Min-young had her name changed. He lookes lost. She asks if Jung-woo had married and he says no. This is a weird scene. Why doesn't he remember? Memory is supposed to be a residual. Everyone else who was in the know before still knows. Dr. Han definitely does. We see him trying to call Sun-woo, who is late to the wedding, but the phone is out of service. Back on April 24, 1993, 11:59, Sun-woo is still waiting in the phone booth in the rain. The timer on his watch hits zero and he still doesn't time-travel. We watch as 2013 Dr. Choi's assistants and car, and finally he himself, go up in smoke. The incense burns out and the ash stump falls over. [40:15] A little box appears on the front seat and then the incense holder and case disappear altogether. (That seems pretty final. The magic is extinct.) After ten minutes Sun-woo smiles wryly at the cosmic joke on him and records a message on his phone telling Dr. Han he is stuck in the past. We pay a visit to Dr. Choi on April 24, 1993 at 12:30. He's still taped to his chair, but the custodian hears him yelling and gets him loose. Driving through the rain, he notices Sun-woo in the phone booth down an alley. 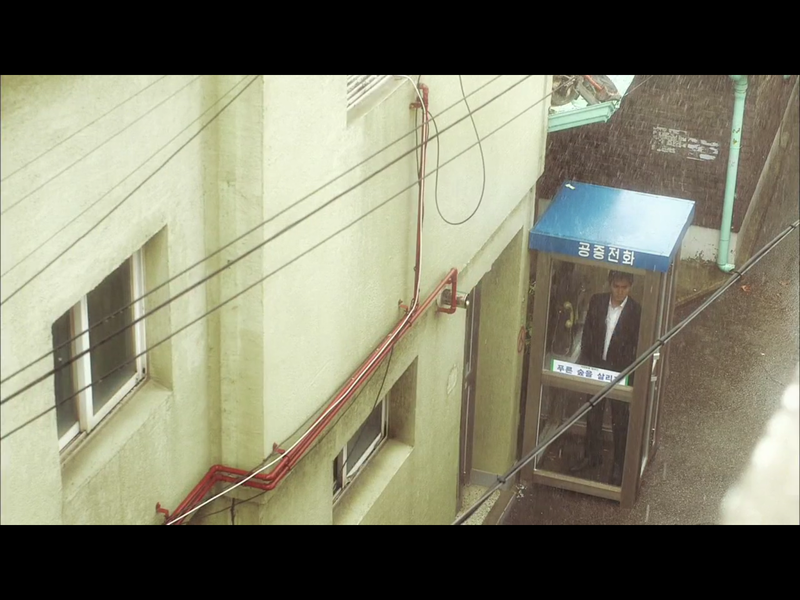 2013 Choi cheers as his 1993 self rams the car right into that phone booth. A man pokes his head out of an upstairs window wondering what that noise was, so Choi drives away. Sun-woo slumps to the ground and sits inside the wreckage as his blood runs and his eyes close. If Past7 is a timeline where hyung became a doctor and wasn't unhappy, he never went wandering around or looked for magic incense. Young Sun-woo's life would be different: he saw a stranger who said he was himself as a grown up. He figured out (from the pills) that he was going to get cancer and prevented it, and went to college while his brother was in jail. He never went to Nepal because he didn't have to claim his brother's body, he never got the little diary because it had never been written, and never had any incense sticks. If he kept the memory of alternate timelines, he would have aquired it in December 2012, when he originally found out, but it looks like he didn't. One artifact of time-travel is that people don't remember what happened in the past of the altered timeline until the twenty-year anniversary rolls around. Adult Sun-woo didn't remember what his teen self had been doing and had to check his diary. The Sun-woo we see meeting Min-young's parents must be that teen Sun-woo who has grown up with this alternate life. He doesn't remember things that were different in the original timeline, and may never do so unless something triggers it. Running count – time travels: 14; remaining incense sticks: 0; Timelines: Past7, Present6.